You can check out the first volume of Mothers of Angels here. CALL FOR SUBMISSIONS: We’re looking for essays and poems for Mothers of Angels 2, an anthology of reflections about living through the grief of losing a child. The main purpose of the anthology is to share stories of support about surviving the grief process and finding a new normal. 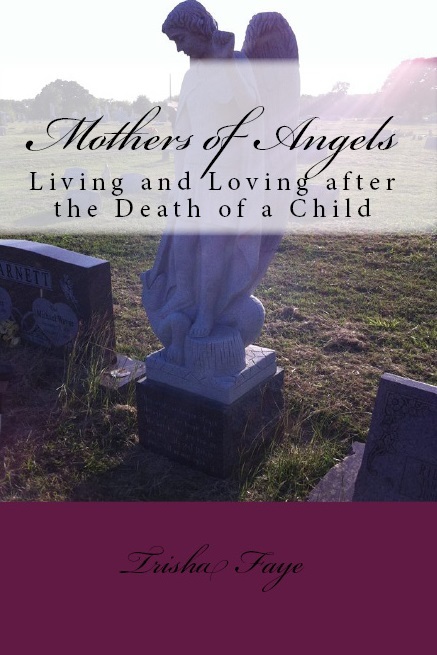 The stories are meant to encourage and inspire other mothers of angels, while also honoring the children whose loss put us on this difficult path. ESSAYS: Essays should be from 1,500 – 3,000 words. Original works only. No reprints. Stories must be a true story, either of your own loss, or of someone you know. No fictional tales! POETRY; Minimum, twelve lines. No maximum. Up to two submissions accepted per person. All contributing authors can purchase additional books at half price. PAYMENT: Payment is at time of publication, late October 2019. You have the choice of payment made via postal service (in continental US only), or via PayPal. Trisha Faye purchases First, One Time Rights for your essay or poem. After 30 days from publication, you are free to resell your essay or poem to other markets. NOTIFICATION: Authors will be notified of selection results by July 20, 2019. Those that are selected for publication will also have the opportunity to submit a photograph of your angel for publication with your essay or poem, if desired. · Include your name, address, and email. If writing under a pen name, specify your legal name and the pen name you’d like to be published under. · A brief bio of 50-100 words. · How you’d like to be paid: If by PayPal, include the email for your PayPal account. If by check, state where you’d like the check to be mailed. In tIn the subject line, include: SUBMISSIONS FOR MOTHERS OF ANGELS, along with your title and author name﻿.